An Automotive Technician will inspect, repair and maintain cars, light trucks,and other vehicles. The job responsibilities listed on a professional Automotive Technician Resume include – interacting with customers to detect the vehicle’s problem, inspecting vehicle engine and other components to identify the accurate issue, repairing and upgrading vehicle; conducting regular maintenance work, scheduling future maintenance sessions, repairing or replacing broken or dysfunctional part, providing repair estimate to the customer, keeping record of work logs and issues, maintaining tools and equipment in working condition, and keeping stock of needed supplies. Whatever may be the setting, an Automotive Technician is expected to demonstrate the following skills to get qualified for this job – excellent knowledge of mechanical, electronic and electric components of the vehicle; working knowledge of vehicle diagnostic systems, ability to handle heavy tools and equipment, willingness to adhere to safety precautions and physical abilities. 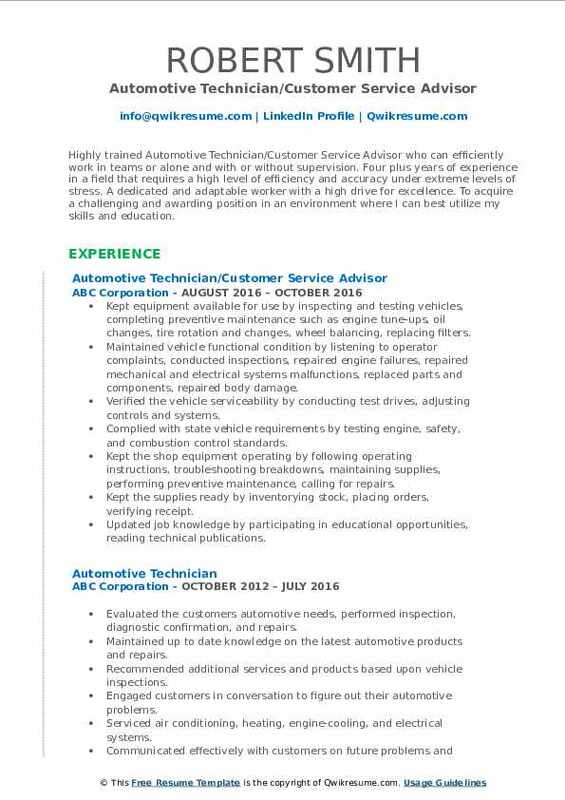 Education requirement for this job includes an Associate’s degree in automotive technology or a vocational training program. Summary : Expert Automotive Technician with twelve plus years of experience and training. Maintains service operations by inspecting and maintaining and repairing vehicles. To obtain a position in the workplace/field. A true asset to the team. having great management, computer, welding, and automotive skills, military experience, and I am well organized. Communicating operational issues and changes to the supervisor on a regular basis. Developing and executing layout and installation of electrical wiring and fixtures based on job terms and city regulations. Employing a wide variety of hand and power tools including hoists, drills, precision measuring instruments and electronic testing devices. Following company procedures to maintain the work environment in a neat and orderly condition. Serving as a maintenance technician with minimal supervision in a customer service environment responsible for conducting repairs on critical vehicle systems to include engine, transmission, electrical, fuel, lubrication, and brake systems. Providing a customary 23 point safety inspection that includes the serviceability and manufacture. Providing recommendations for components such as tires, wipers, lights, fluid levels, air filters, suspension and drive lines, and exhaust systems. Performing maintenance related task that includes draining and re-filling fluids in crankcases, transmissions, and differentials, lubricating vehicles to specifications, replacing oil, air, and fuel filters, and providing multi-point fluid level inspection and replenishment. 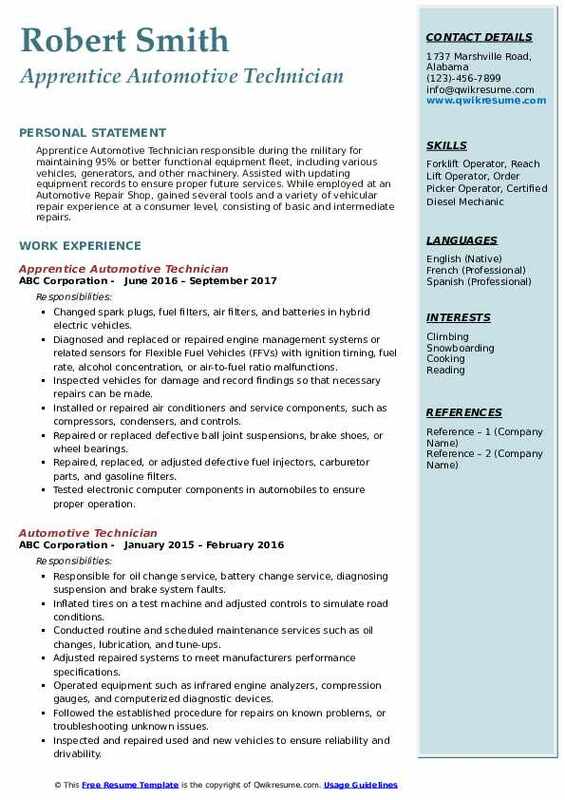 Objective : Diligent Automotive Technician/Mechanic with two plus years of experience committed to staying current with advances in repair technology. Auto Mechanic who implements excellent diagnostic skills. Discovers the root of the problem quickly and works to find solutions. 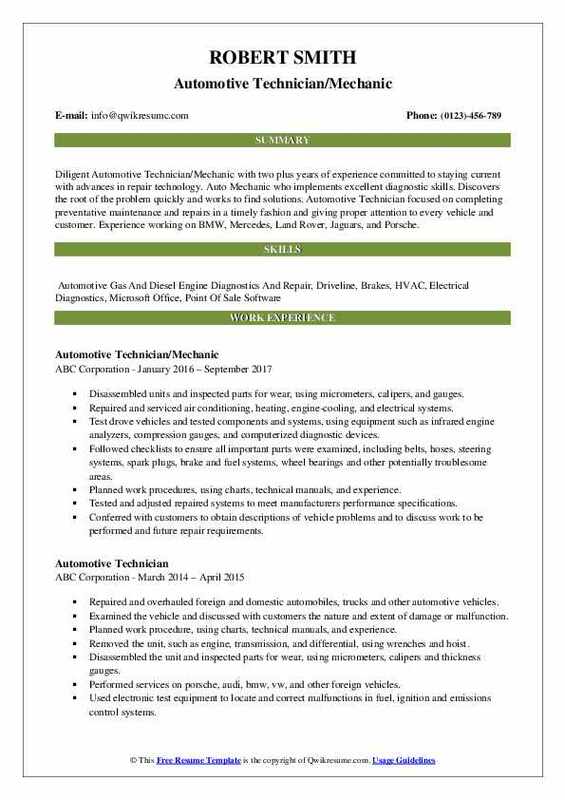 Automotive Technician focused on completing preventative maintenance and repairs in a timely fashion and giving proper attention to every vehicle and customer. Experience working on BMW, Mercedes, Land Rover, Jaguars, and Porsche. Disassembled units and inspected parts for wear, using micrometers, calipers, and gauges. Repaired and serviced air conditioning, heating, engine-cooling, and electrical systems. Test drove vehicles and tested components and systems, using equipment such as infrared engine analyzers, compression gauges, and computerized diagnostic devices. Followed checklists to ensure all important parts were examined, including belts, hoses, steering systems, spark plugs, brake and fuel systems, wheel bearings and other potentially troublesome areas. Planned work procedures, using charts, technical manuals, and experience. Tested and adjusted repaired systems to meet manufacturers' performance specifications. Conferred with customers to obtain descriptions of vehicle problems and to discuss work to be performed and future repair requirements. Performed routine and scheduled maintenance services such as oil changes, lubrication, and tune-ups. 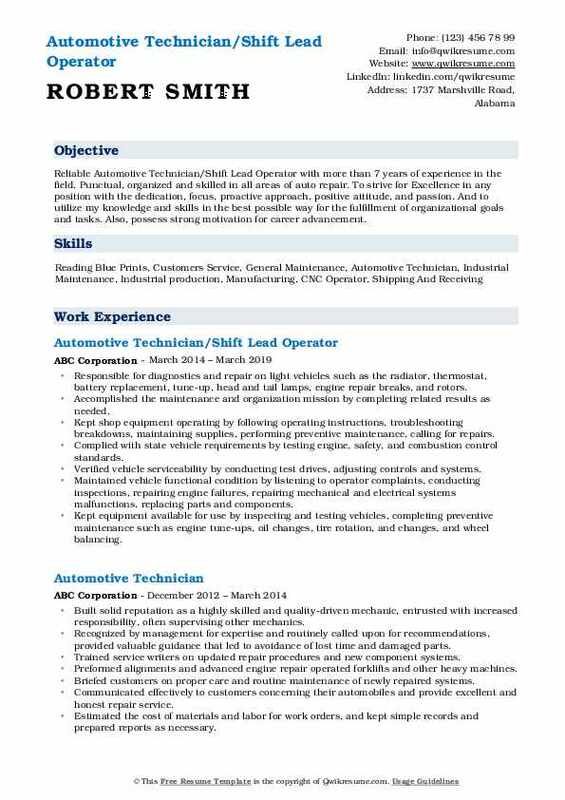 Objective : Highly trained Automotive Technician/Customer Service Advisor who can efficiently work in teams or alone and with or without supervision. Four plus years of experience in a field that requires a high level of efficiency and accuracy under extreme levels of stress. A dedicated and adaptable worker with a high drive for excellence. To acquire a challenging and awarding position in an environment where I can best utilize my skills and education. Skills : Forklift Operator, Welding, Fabrication, Detailing, Wiring, And Upholstering. Kept equipment available for use by inspecting and testing vehicles, completing preventive maintenance such as engine tune-ups, oil changes, tire rotation and changes, wheel balancing, replacing filters. Maintained vehicle functional condition by listening to operator complaints, conducted inspections, repaired engine failures, repaired mechanical and electrical systems malfunctions, replaced parts and components, repaired body damage. Verified the vehicle serviceability by conducting test drives, adjusting controls and systems. Complied with state vehicle requirements by testing engine, safety, and combustion control standards. Kept the shop equipment operating by following operating instructions, troubleshooting breakdowns, maintaining supplies, performing preventive maintenance, calling for repairs. Kept the supplies ready by inventorying stock, placing orders, verifying receipt. Updated job knowledge by participating in educational opportunities, reading technical publications. Accomplished the maintenance and organization mission by completing related results as needed. 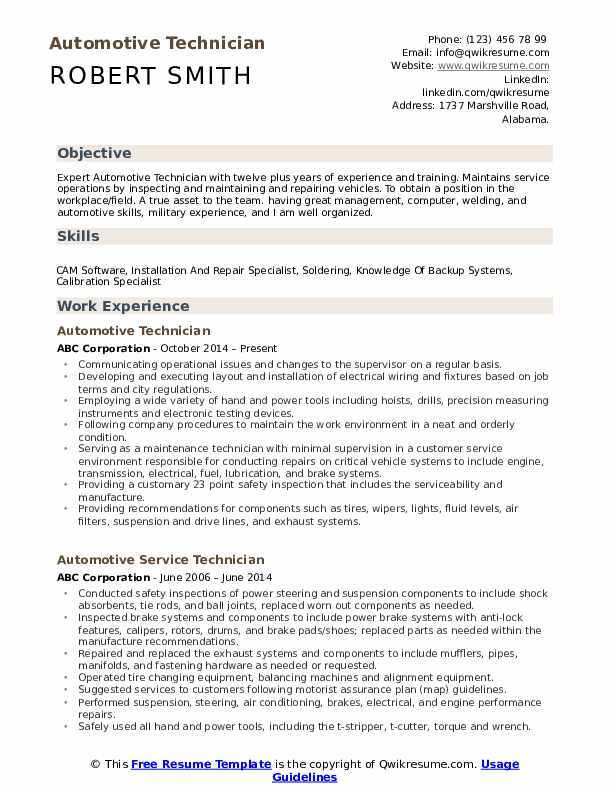 Objective : Apprentice Automotive Technician responsible during the military for maintaining 95% or better functional equipment fleet, including various vehicles, generators, and other machinery. Assisted with updating equipment records to ensure proper future services. While employed at an Automotive Repair Shop, gained several tools and a variety of vehicular repair experience at a consumer level, consisting of basic and intermediate repairs. Changed spark plugs, fuel filters, air filters, and batteries in hybrid electric vehicles. Diagnosed and replaced or repaired engine management systems or related sensors for Flexible Fuel Vehicles (FFVs) with ignition timing, fuel rate, alcohol concentration, or air-to-fuel ratio malfunctions. Inspected vehicles for damage and record findings so that necessary repairs can be made. Installed or repaired air conditioners and service components, such as compressors, condensers, and controls. Repaired or replaced defective ball joint suspensions, brake shoes, or wheel bearings. Repaired, replaced, or adjusted defective fuel injectors, carburetor parts, and gasoline filters. 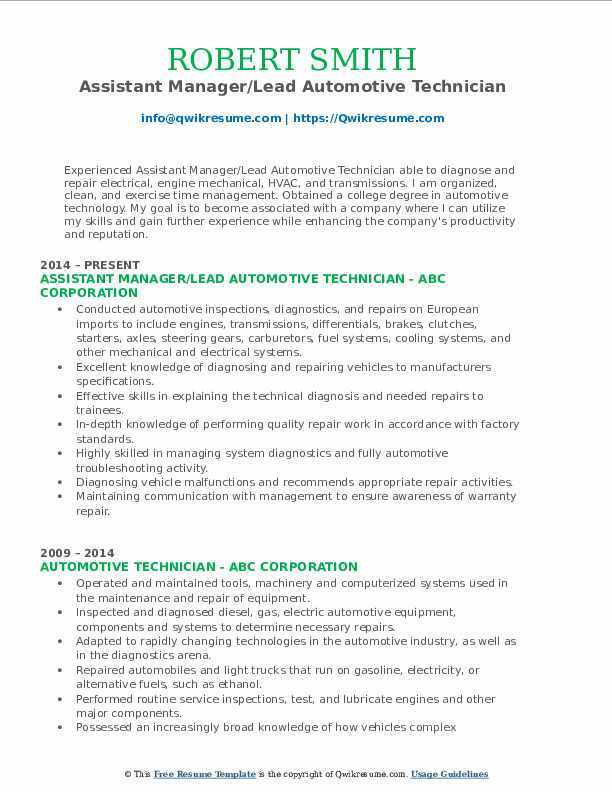 Summary : Reliable Automotive Technician/Shift Lead Operator with more than 7 years of experience in the field. Punctual, organized and skilled in all areas of auto repair. To strive for Excellence in any position with the dedication, focus, proactive approach, positive attitude, and passion. And to utilize my knowledge and skills in the best possible way for the fulfillment of organizational goals and tasks. Also, possess strong motivation for career advancement. Responsible for diagnostics and repair on light vehicles such as the radiator, thermostat, battery replacement, tune-up, head and tail lamps, engine repair breaks, and rotors. Kept shop equipment operating by following operating instructions, troubleshooting breakdowns, maintaining supplies, performing preventive maintenance, calling for repairs. Verified vehicle serviceability by conducting test drives, adjusting controls and systems. Maintained vehicle functional condition by listening to operator complaints, conducting inspections, repairing engine failures, repairing mechanical and electrical systems malfunctions, replacing parts and components. Kept equipment available for use by inspecting and testing vehicles, completing preventive maintenance such as engine tune-ups, oil changes, tire rotation, and changes, and wheel balancing. Summary : Experienced Assistant Manager/Lead Automotive Technician able to diagnose and repair electrical, engine mechanical, HVAC, and transmissions. I am organized, clean, and exercise time management. Obtained a college degree in automotive technology. My goal is to become associated with a company where I can utilize my skills and gain further experience while enhancing the company's productivity and reputation. Conducted automotive inspections, diagnostics, and repairs on European imports to include engines, transmissions, differentials, brakes, clutches, starters, axles, steering gears, carburetors, fuel systems, cooling systems, and other mechanical and electrical systems. Excellent knowledge of diagnosing and repairing vehicles to manufacturer's specifications. Effective skills in explaining the technical diagnosis and needed repairs to trainees. In-depth knowledge of performing quality repair work in accordance with factory standards. Highly skilled in managing system diagnostics and fully automotive troubleshooting activity. Diagnosing vehicle malfunctions and recommends appropriate repair activities. Maintaining communication with management to ensure awareness of warranty repair. Effectively searching within service and maintenance manuals to perform repairs and diagnosis without supervision. 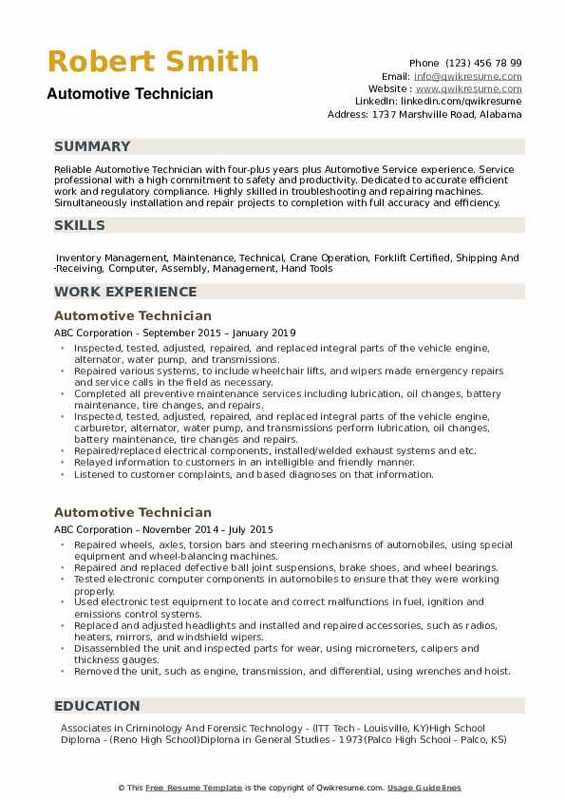 Headline : Master Automotive Technician focused on completing preventative maintenance and repairs in a timely fashion and giving proper attention to every vehicle and customer. Hard worker and a team player. Reliable as well as responsible. Able to learn, grow and adapt to the necessary requirements. Has about 5 plus years of technical experience in the field. Has worked on domestic, imported and heavy-duty vehicles. Enjoys work and learning new things. Responsibilities include organizing work by reviewing daily requirements, checking and gathering supplies. Keeping vehicles presentable by washing and polishing exterior, vacuuming and polishing interior, removing waste. Securing vehicles by locking doors, windows, and trunks, observing and reporting suspicious persons and incidents. Maintaining a safe environment by watching out for pedestrian traffic, following standards and procedures, complying with traffic and driving regulations. Updating job knowledge by participating in educational opportunities, reading service publications. Accomplishing maintenance and organization mission by completing related results as needed skills used equipment maintenance, lifting, decision making, problem-solving, reporting research results, self-motivated, judgment results-driven, quality focus, productivity, safety management. 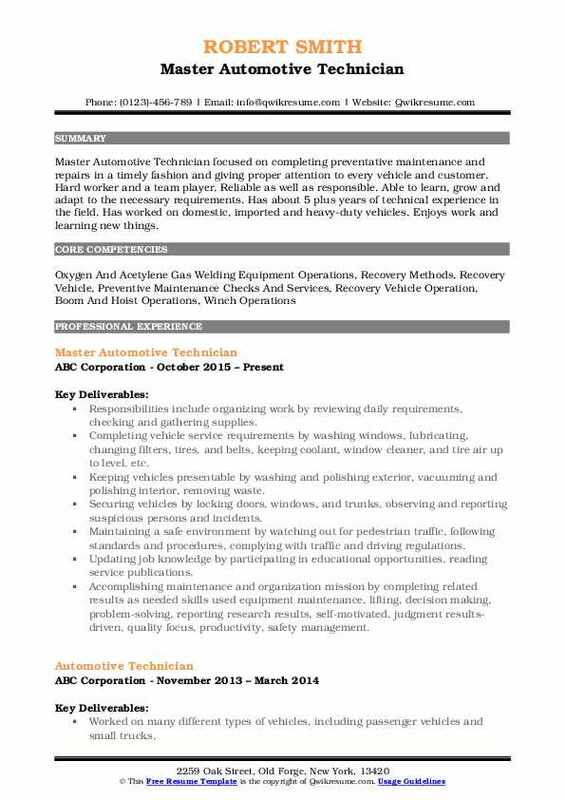 Objective : Reliable Automotive Technician with four-plus years plus Automotive Service experience. Service professional with a high commitment to safety and productivity. Dedicated to accurate efficient work and regulatory compliance. Highly skilled in troubleshooting and repairing machines. Simultaneously installation and repair projects to completion with full accuracy and efficiency. Inspected, tested, adjusted, repaired, and replaced integral parts of the vehicle engine, alternator, water pump, and transmissions. Repaired various systems, to include wheelchair lifts, and wipers made emergency repairs and service calls in the field as necessary. Completed all preventive maintenance services including lubrication, oil changes, battery maintenance, tire changes, and repairs. Inspected, tested, adjusted, repaired, and replaced integral parts of the vehicle engine, carburetor, alternator, water pump, and transmissions perform lubrication, oil changes, battery maintenance, tire changes and repairs. Repaired/replaced electrical components, installed/welded exhaust systems and etc. Relayed information to customers in an intelligible and friendly manner. Listened to customer complaints, and based diagnoses on that information.